I see that Belgian serialist Henri Pousseur is not mentioned. Or, perhaps, he has already been forgotten. Not forgotten Kyle. Just wating for someone to fill in the details. Henri Pousseur was born in Malmédy in French speaking Wallonia in 1929. In the 1950s he was active in the international avant-garde music scene (dodecaphonic, serial, electronic, aleatoric music), together with Boulez, Stockhausen, Berio, and others, and like Boulez he was heavily influenced by Webern. 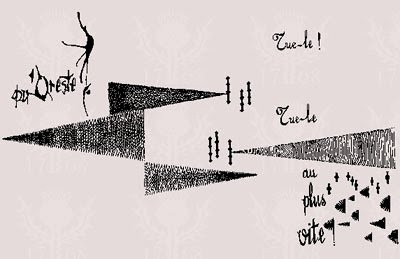 The image above is a page from Pousseur's score for Electre (credit Universal Editions, Vienna). After 1960 Pousseur rejected the narrow viewpoint of the avant-garde, and, in collabaration with the French writer Michel Butor, he adopted an inclusive approach which embraced a range of styles and viewpoints. Their 1962 opera Votre Faust forged a connection between contemporary music and history by casting the audience as performers. The influential Centre de recherches et de formation musicales de Wallonie (CRFMW) in Liège was founded by Pousseur in the 1970s. He also established the Institut de Pédagogie musicale de Paris in the 1980s, which is now integrated into Paris' Cité de la Musique. Among Henri Pousseur's prolific output are the electro-acoustic music sequences for the 1961 production of Offenbach's Les Contes d'Hoffmann at the Théâtre Royal de la Monnaie in Brussels. The choreography for this opera was created by the great Maurice Béjart, who died yesterday (Nov 22, 2007) aged 80. The English website of Henri Pousseur's publisher is here, his own French website is here. And read about yet another serialist from the old world here. Somebody should release a disc of Pousseur's piano music. He has composed for piano solo throughout his career, in a wide variety of styles, ranging from the mobile forms of the Caractères in the1960s to the pastiches of Tchaikovsky, Beethoven and Schubert in the 1980s. I recently published a short post about his recent electroacoustic set, Paysages Planétaires here. Thanks for that contribution Caleb. "After 1960 Pousseur rejected the eclecticism of the avant-garde, and, in collabaration with the French writer Michel Butor, he adopted an inclusive approach which embraced a range of styles and viewpoints." So after having rejected 'eclecticism', he embraced 'eclecticism'. GH - fair point. I've changed the wording now. A reader tells me that, although Malmédy is in Wallonia, its inhabitants in fact speak German.